Here's an easy magic trick with playing cards. A spectator chooses a card from several that you display in your hand. Afterwards, you show the spectator that the card that they chose was the only one that was different - in this case, the only red-backed card in a bunch of blue-backed cards. This one is quite sneaky and the secret lies in the calculated way that you display the cards. Another intriguing aspect of this trick is that the end result can change depending on the spectator’s choice. Intrigued? Read on to learn this trick. Here's what you'll need to perform the trick. Gather ten cards - five from a blue-backed deck and five from a red back deck. Alternate the cards so they look like the cards in the picture. To perform the trick, bring out the cards and spread and display them to the spectator. Be careful that you don't show the backs of the cards. Ask the spectator to point to any face-up card that you are showing. Cut the deck at this card, as shown in the picture. In this example, the spectator has chosen the king of spades. However, the spectator is free to choose any card. Lay the selected card, in this case, the king of spades, onto the table, face-up. Take all of the cards that you cut above the king of spades and place these underneath the rest of the cards in your left hand. In this picture, I'm going to show you what the trick looks like to the spectator and then explain the steps in the next picture. To the spectator, you'll be displaying the backs of a pair of cards. In this case, blue cards. And then tossing them onto the table face-up. After you've displayed all of the cards, the spectator will think that he has seen cards of the same colored back. Here’s how to display the cards. 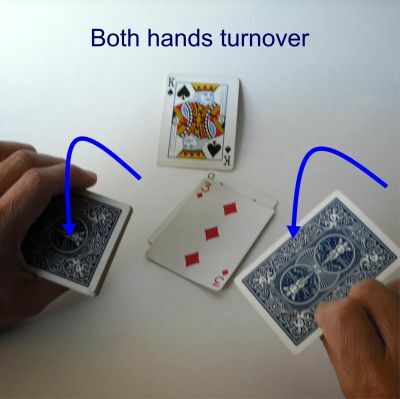 The top card from the stack of cards in your left hand goes to your right hand. You then turn both hands over to apparently show blue on the back of both cards. Important point. Keep in mind that the color of the cards being displayed will depend on the card that the spectator chose. As a result, if you are following along and find that you are displaying red-backed cards when I am talking about blue-backed cards, as long as the cards are consistent as you show them, you’re fine. You turn both hands over so the cards are face-up, and then place the card in your right hand into a pile on the table (face-up). Your left hand then deals the top face-up card into the pile. This is the secret move. You have apparently shown a blue card in your left hand, but you have actually shown the back card, which is a blue card. You are secretly dealing a red-backed card face-up onto the pile on the table. The spectator thinks he's seeing all blue-backed cards. You repeat the last three steps until you've exhausted the stack of cards in your left hand. The spectator will think he has seen all blue-backed cards. Turn over the spectator's card to show that it was the only red-backed card in a stack of blue-backed cards. (Or vice versa, if the spectator's selection goes the other way).